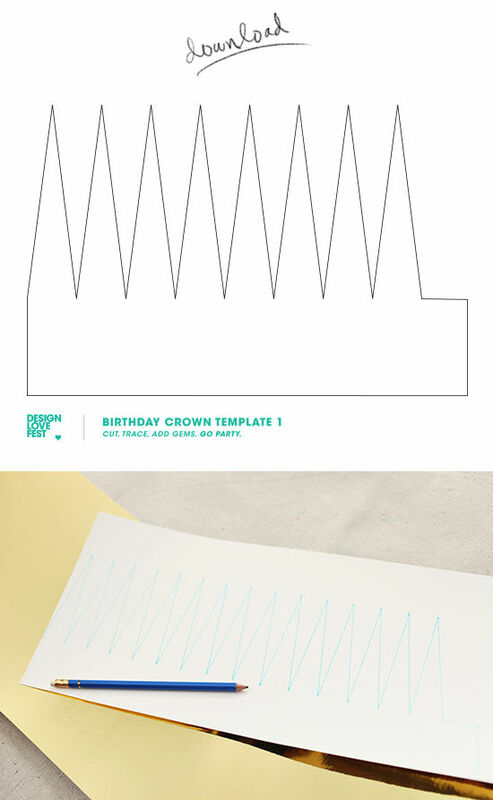 • DOWNLOAD CROWN TEMPLATES HERE	(5047 downloads) and print two copies out. • cut them out and tape or glue together to make the length of the crown (we’ve made one crown that is small and sits on top of your head and one that will fit around it. but if you want to make either bigger or smaller (say for kids) all you have to do is add or subtract length by printing an additional template or cutting one down. • lay down the template on the backside of your poster board and trace the shape with your pencil. 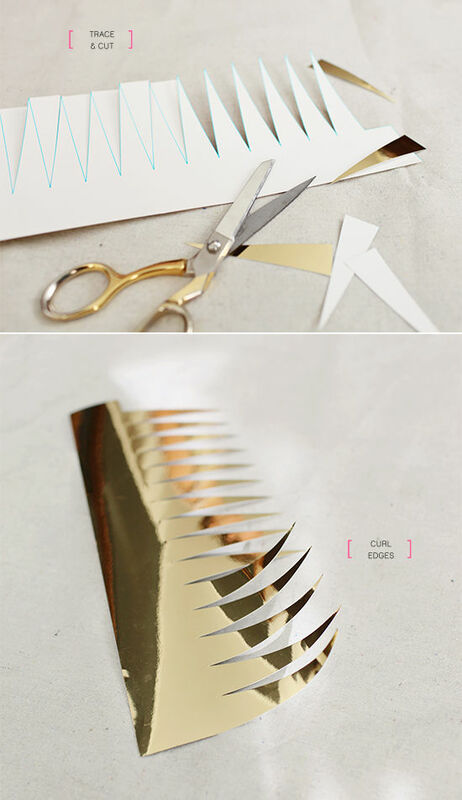 • cut out your crown base with scissors. • if you’ve made a little pointy crown you can add some style to it by curling the ends. • here comes the fun part, glue as much stuff to your crown as you can come up with. maybe you can’t decide if you want to use glitter or gemstone, rule like a queen and use both. this is your chance to indulge, for one of our crowns we applied a layer of spray glue and dumped a giant bowl of sequins on top… twice. • or maybe you play it straight and you just embellish a little, your choice, it’s your birthday. • finally wrap the ends around, apply glue and secure with a binder clip until dry. 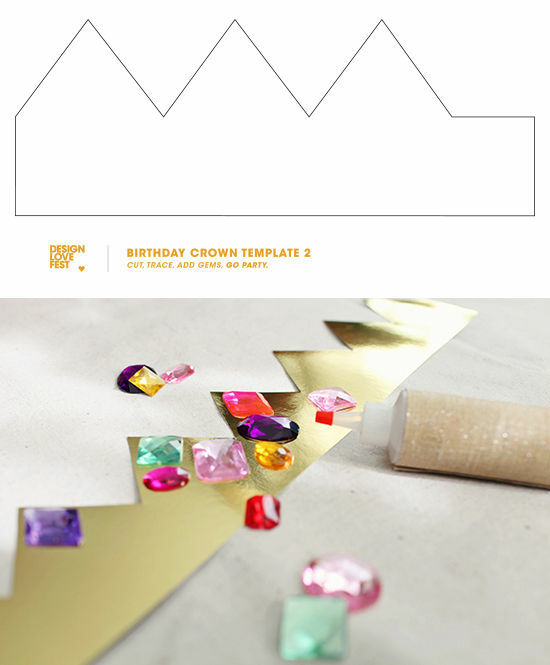 also, download & print the second crown template	(4702 downloads) for a more classic crown shape & jewel it up. THEN…you take those babies on the road! we rented a white stretch limo (cheesy & amazing) and went to a bunch of photo booths before the birthday party started. it was a total blast & definitely one of my more memorable birthdays! as always, let us know if you made them & how they turned out! OMG TOO CUTE! Definitely making myself one! This is such a cute idea! 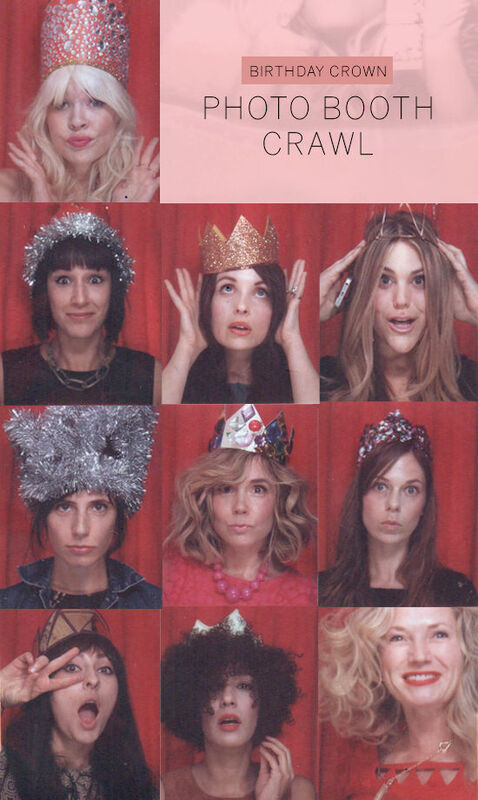 I love the photo booth idea for a party! where do you get SHINY GOLD poster board? i have never seen this even at an art supply store! So fun- I def have to do this for my birthday! Thanks for the great idea! 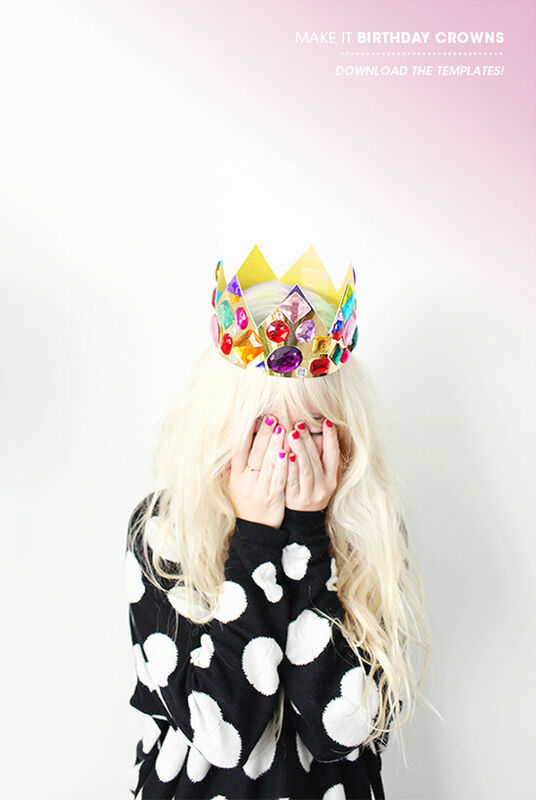 Such a perfect excuse to wear a crown all day! I love the options you have to decorate them. very cute! they are all so adorable. i can’t decide what’s my fav. Very fun DIY! Love it! Your birthday crown is too fab for words! I’m sitting here giggling at all the photo booth party pics of you and your friends! LOVE! What size paper would you recommend printing these on? This is my favorite DIY ever! Not even kidding. I need this in my life!!! I’m a huge proponent of birthdays and this project is totally happening!! Amazing project! Thanks for sharing!! These are amaaaazing! It looks like you had so much fun! Happy belated birthday! Pingback: Coco&Cowe » Stay Warm And Have A Great Weekend…. 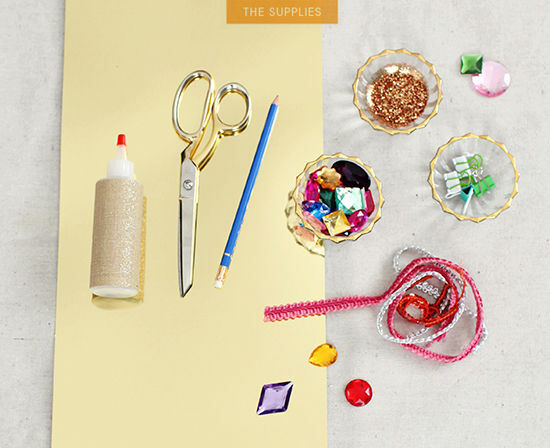 How fun is this d.i.y ?? My niece would love this! Well, I see I’ve found my run-to-the-grocer’s headgear. These are all so adorable…definitly going to have to make these for my birthday. These are all adorable…can’t wait to make them for my birthday. This crown is adorable! How fun for parties, or even weddings. =) Just Pinned this. Pingback: Coco&Cowe » Host An Oscar Party! I adore this! My mom used to refer to herself as “Queen Goodly” (goodly, not godly, thankfully!) and would wear a plastic crown whenever we went on vacation. This was cringe-worthy ’til I got old enough to care (not ’til my 30s). I am totally going to do this in her honor at my next party! Who wouldn’t want to wear a crown?! This reminds me of the amazing b-day parties my mom threw as a child, such great memories. AND, I happen to spot my dear cousin Cassie Jo right below you!! I’m slightly certain I will learn many new stuff proper right here! Really no matter if someone doesn’t understand then its up to other users that they will help, so here it happens. That’s very creative, my little girl will love props like this for her birthday party! Thanks so sharing. I experience examine great web sites and additionally completed some,your work is definitely superb.Hats off for your enthusiasm frankness.Do hold all of us enlightened at a later date as well. browsing this website dailly and obtain fastiudious dafa from here all the time. I really like your writing style, good info, thanks for posting :D. “Let every man mind his own business.” by Miguel de Cervantes. 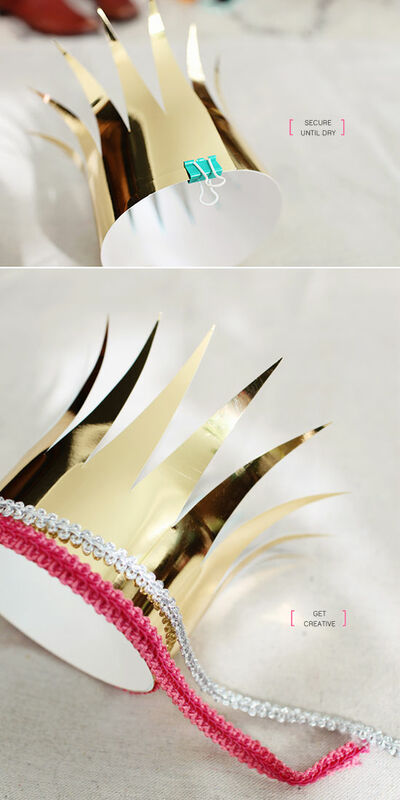 It’s an easy and super awesome way to make crowns.. i did one for my little one’s birthday last week thank you!!! My son is going to love something like this. Lovely.